Athlete's Foot | Itchy Foot Infection | Podiatry Care Specialists, PC Do you suffer from scaly, itchy skin on your feet? You may have athlete's foot! Dr. Suchak explains the treatments for this condition. Athlete’s Foot is a fungal infection of the foot. It attacks the skin and grows in dark moist places. The soles of the feet contain many sweat glands, so that is the most common place for the fungus to infect the skin. Due to athletes being very active and creating a great deal of perspiration when performing their particular activities, athlete’s foot became the common term for this condition, but it can happen to anyone. People with sweaty feet or palms of their hands, a condition called hyperhidrosis, can also be susceptible to athlete’s foot, for instance. As mentioned, a dark, moist environment is a favorite place for fungi to lurk. A prime example of such a hideout is inside your shoes! However, don’t think going barefoot is the solution. Baring your skin, especially in public areas like pools, gyms, locker rooms, and saunas, puts your feet at risk. 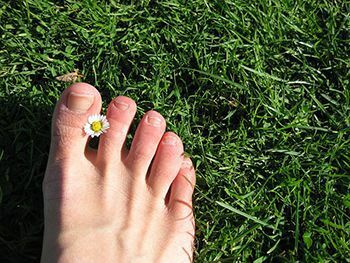 That’s because the fungal infection of athlete’s foot can easily be passed, not only from person to person, but by coming in contact with a contaminated surface, like a shower floor or even a towel. The primary step that someone can take to eliminate or prevent athlete’s foot, is to keep the environment around their feet dry. That includes applying a spray or powder in your shoes and on your feet daily. There are anti-fungal products and non-fungal drying agents such as baby powder and anti-perspirants to suppress the moisture accumulated during the course of the workday or athletic event. Wear clean, dry socks and change them regularly if they get sweaty. Choose shoes made of breathable materials, and alternate pairs each day to allow them ample time to dry out. Also, be sure to slip on shower shoes when walking in public areas, and never share footwear, socks, or towels. If your feet itch and/or burn, starting with between your toes; if you notice cracked, peeling or scaly skin; or you have redness or blisters, you likely have already contracted athlete’s foot. Keeping your feet clean and dry will help to accelerate your recovery. In addition, an anti-fungal gel or cream may be prescribed to treat the condition. In severe cases, an oral anti-fungal agent may be prescribed for a short period of time as well. Treatment regimens can vary from person to person. The experts at Podiatry Care Specialists can help determine the best course of action for your individual situation. Remember, though, once your athlete’s foot clears up, it’s important to be proactive to avoid a reoccurrence. Follow the steps above to get a step up on fungal infections! If you think you may have athlete’s foot, let Podiatry Care Specialists make the call after you make the call to us. Dial 1-877-905-5907 to reach any of our 5 convenient PA locations. You can also visit our website at www.podiatrycarespecialists.com to find out more about how you can fight foot fungus.